It is 10:30 pm on my birthday. I should be washing my face, saying my prayers and crawling in bed. But what am I doing instead? Baking french toast for my husband who has to wake up at 6am to play the drums in church. Please forgive me for the fact that you'll be reading this Sunday afternoon and might be totally confused. For the record, it is currently Saturday night, January 22nd. As you probably know, I've been at a total loss to find new recipes for my newly-skinny husband. This diet consumes him (aka, our entire household), and I'm getting pretty sick of grilled chicken and eggs. Let's not tell him that this recipe actually has **GASP** sugar in it. You'll keep my little secret, won't you? The nice thing about this is that it doesn't involve a lot of preparation. There's no stove work required, which is my favorite thing ever. I hate having to grill, fry, or saute before anything actually goes into the oven. So next time you hear the words "french toast," don't cringe. This is semi-healthy, as the only really unhealthy thing in it is sugar. Everything else is pretty harmless. Grab the bread and layer it on the bottom of a smaller square of rectangular pan. You'll probably have to tear the bread to fit the pan correctly. Grab 2 large, fresh apples and peel and core them. Finally, chop them up into little pieces. Now, in a mixing bowl, throw in 3 large eggs. Whisk it up, and please do it slowly. You don't want this egg-y mixture all over your white rug like I did. Tim, if you're reading this, we need to invest in a dark-colored rug. Pour half of this mixture over the bread. Add half the apples and layer them evenly. In a small bowl, add 1/3 cup sugar, a tablespoon of cinnamon and a pinch of nutmeg. Stir it all up. Sprinkle half the mixture over the apples, then add the remaining apples. Pour the rest of the egg mixture over the top of the apples. Sprinkle the rest of the cinnamon sugar mix on top. Grab 1/2 stick of butter and slice it thinly, then layer them on top of our masterpiece. Now, you're supposed to cover this with tinfoil and put it in the fridge overnight. I, however, do not have that option as I will not be waking up at 5am to put this in the oven. It's up to you. I don't make the rules, but this is one I don't intend to follow. Bake uncovered at 350 degrees for an hour. This is a gooey, sticky, marvelous mess. And yes-it's totally worth it. Serve it warm with more butter and optional maple syrup. I might have to try this! Breakfast is my favorite meal and I love anything in syrup (yikes)! I m making this one this week! 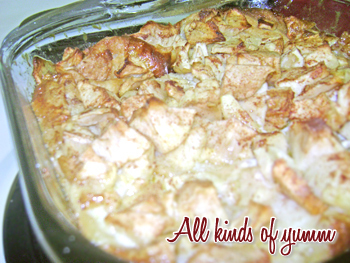 ooh yummy, this is like what we called in England 'Bread Pudding'... a truly delicious winter pud. very nice break fast..i think this is a cooking tutorial blog..ya really i can do..to take your suggestion..
um, yum. this is definitely being planned soon! thanks rach and i hope you had a wonderful birthday :) love you and MISS YOU!! !